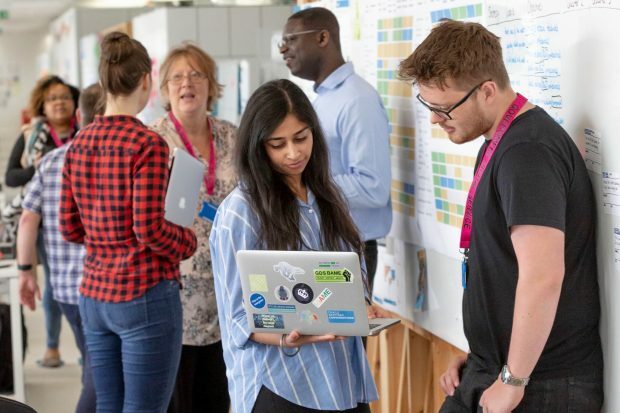 Earlier this year, the Digital, Data and Technology (DDaT) Profession hosted a supplier event at the Government Digital Service to explore how government could better partner with external organisations to drive diversity initiatives across the profession. Dame Sue Owen, former Permanent Secretary at the Department for Digital, Culture, Media and Sport and Civil Service Diversity and Inclusion Champion chaired the event. The event was an opportunity to engage with more than 25 organisations that can help us increase awareness and change the perception of opportunities in Digital, Data and Technology among people in education, and specifically among groups currently under-represented in our workforce. We ran a series of roundtables to give the attendees a chance to discuss the biggest opportunities and challenges for this area of work. They were also encouraged to think about what success would look like. Those who attended made a number of great contributions, which can be grouped into 5 main takeaways. We need to look at all aspects of diversity. We also need to make sure we’re looking beyond gender diversity. We will need a compelling proposition, which shows what makes us unique. This is so that government as an employer can become an attractive option for everyone. Early education and the school curriculum need some changes to help raise awareness of digital careers. Apprenticeship opportunities should be optimised to provide greater talent pipelines. We need champions and role models from a variety of sectors to help share success stories. My sense is that more sessions like these will be extremely valuable. They will help us to continue to build greater insight and a collective approach. This will bring us closer to increasing diversity across the DDaT Profession, and it will help us deliver change at scale. This type of session will help inform how we choose to engage with a number of suppliers to support our diversity ambitions. An immense thank you to everyone who came along and to the members of our newly established cross-government Diversity in DDaT Working Group, who facilitated roundtable discussions on the day. The baton was recently handed over to me to continue our cross-government work on DDaT diversity for the DDaT Profession. I am keen that we continue to collaborate and learn from each other – not only across the Civil Service but with our external partners. We’ll be working to agree those specific activities that will bring immediate benefits, as well as those which will lead to long-term sustainable change. As this event was a recommendation from the Diversity in DDaT Working Group, I am looking to reconvene this group in the coming weeks. It will be my intention to agree a set of immediate next steps around this work so we can begin to address the themes that came up during the event as one profession. We will update you on this blog on how this conversation develops. If you’d like to know more about the cross government Diversity in DDaT Working Group please email DDaT Diversity. Follow Caroline Murray on Twitter and subscribe to this blog for updates. If you are interested in attending our Breaking Down Barriers event on Tuesday 23 April there are a few tickets left so be sure to register.